Can Diet Help In Curing Nail Fungus? Modifying your diet sometimes helps to cure an illness. Even nail fungus infection can be curbed by modifying one’s diet. Nail fungus is caused by microorganisms such as fungi, yeast etc. Certain food stuff could be beneficial in getting rid of nail fungus. That means understanding food in terms of the antiseptic and antifungal properties it could be having and selecting a diet that is most likely to be beneficial in curing nail fungus infection. The idea is to eat the right food and build up one’s immune responses so that the body can itself fight off infections like nail fungus. Avoid alcohol especially wine and beer as they have microbial inhibitors. These could trigger candida and nail fungus infection. Instead, try home fermented drinks. But if your symptoms return, then avoid the drinking habit totally. Cutting your intake of caffeinated drinks and alcohol can stop their dehydrating effect on your body as well. Refined carbohydrates are taboo. Do not include them in your diet. This means cut down on bread, cookies, candy, cakes etc. Instead get your carbohydrates from vegetables like peas and potatoes. If that doesn’t appeal to you, try brown rice and porridge which are whole grains. Otherwise try brands like Manna bread and Ezekial bread which are sprouted grain preparations. Select the carbohydrate source in your diet depending on your energy levels and possibly your symptoms. Here are some food items and food ingredients that are best avoided in your diet. To have a diet that could be beneficial in curing your nail fungus, avoid these foods and food ingredients. Also avoid honey and maple syrup either alone or as ingredient of wholesome food since they are concentrated sweeteners not ideal for getting rid of your nail fungus. Water is vital to the human body. It is a constituent of every body tissue. Many body processes like digestion, absorption and circulation depend on water. Consumption of water is important for maintaing body temperature and joint lubrication as well. Reckon with water as a natural cure for your body. Therefore water should be an important part of your diet. Drink plenty of water. But it must be clean, hygienic water. How much of water should you be drinking? It should be approximately half your weight. For example, if you weigh 200 pounds then drink a minimum of at least 100 ounces of water per day. Drinking water can self cleanse your body and keep it free of fungal infections like nail fungus. Fungi usually cause infection in our body when our immune system weakens. That’s how nail fungus infection develops. The need to have a proper diet is to strengthen our immune system. A healthy immune system can prevent infections like nail fungus. Include plenty of garlic and onion in your diet. Both have antifungal effects. An anti-fungus diet devoid of toxins and which includes plenty of water will be helpful in getting rid of nail fungus. Drink lots of water including fruit and vegetable juices. Try Pau d’arco tea. It’s ideal for drinking or using as a soak for the toes. Many people have found probiotics in diet to be useful in curing nail fungus. Probiotics are live microorganisms which when taken as a food item is considered beneficial to the gut. Probiotics have other health benefits as well. So you could add probiotics in your diet as for example kefir and yogurt. Adding yogurt and kefir to your diet for a couple of months can make a lot of difference. 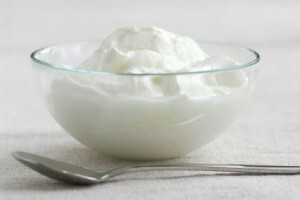 Eat 1 to servings of yogurt per day and 6-8 ounces of kefir everyday. That will help eliminate your nail fungus infection. You can either make kefir yourself or buy it from a grocery store. Try yogurt with but not the sweetened variety. Or try Stonyfarm or Horizon brand yogurt. Whichever yogurt you take it has active cultures with good bacteria. As a probiotic, yogurt is beneficial in curing nail fungus infection. Perhaps kefir could be more powerful and useful than yogurt in curing your nail fungus. It is also well known that kefir is good for a lot of other medical conditions including metabolic disorders, allergies, in preventing thickening of the arteries and even in treating cancer. So it will do you no harm to include kefir in your diet irrespective of whether you have nail fungus or not.